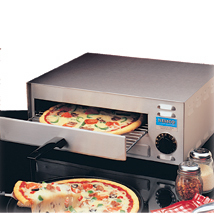 For fast convenient heating of pizza, sandwiches and other foods, these high quality, versatile ovens are the answer. Thermostat is set to 450 F. Features stainless steel case, 14-inch racks, easy clean crumb tray and 15 minute timer. 120 volts. UL approved.